For children 12 months and older, this adorable kiddy pool is designed with a padded base and inflatable back to keep your child safe from any hazards. A perfectly safe and fun first pool for your baby, it's ideal for indoor and outdoor play and can be taken on road trips to picnics or grandma and grandpa's house for out of the house play! Designed with a padded base and an inflatable back to keep your child safe from slips, bumps, and direct sunlight. Perfect first pool for your baby with enough water to splash around without being dangerous. Great for indoor use too; just fill with play balls instead of water! 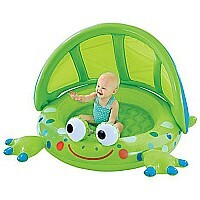 Our adorable green frog pool is ideal for play at home or on-the-go. Package includes (1) pool with inflatable shade to protect baby from direct sunlight. Ages 12 months and up. Recommended for ages : 1 to 2. Designed with a padded base and an inflatable back to keep your child safe from slips, bumps, and direct sunlight. Perfect first pool for your baby with enough water to splash around without being dangerous. Great for indoor use too; just fill with play balls instead of water! Our adorable green frog pool is ideal for play at home or on-the-go. Package includes (1) pool with inflatable shade to protect baby from direct sunlight. Ages 12 months and up.